...multi-tasker. OR at least I like to think that what I'm doing could be classified as such. Does *thinking* about putting away the clean dishes count? If it does, I'm going to add that to the list and eating chips...I'm thinking about switching from Skittles to Lays chips right now. Of course, the hubby and baby are knocked out cold in bed. I wonder if I'll ever out grow this night owl phase. Tiffany gave me the heads up on some of the deals she found tonight. (See her, she's over there to the left...pretty, huh?) She'll be your personal shopper for the day. Thanks, Tiff! Bandolino Blu Women's Brady Denim Skimmer (size 6-14) and size 16W - 24W FOR 80% OFF!!! WOW! Under $9 and eligible for FREE shipping. Gloria Vanderbilt Women's Michaela City Short for $6.80 - 80% off and eligible for FREE shipping. 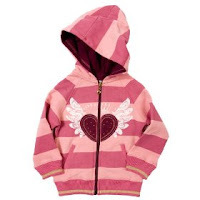 OK, way too cute jackets and coats..
--Please Mum Striped Fleece Lined Girls Hoody $10.99 - 68% off! --So cute I can barely stand it...Paul Frank Pink Jacket $14.95 - 76% off! --Pepe Jeans Girls Salai Plaid Anorak Reg $120 Sale: $30.00 - 75% off! --So we don't leave out the little boys...Tiffany has 3 girls so pink is usually on her brain. ;-) Boy's Please Mum Printed French Terry Boys Hoody 71% off for $7.99! --Boy's Please Mum Flannel Plaid Hooded Jacket 70% off for $8.99! --Dogwood - Boys Long Sleeve Zip Up Jacket, Olive, Purple 82% off for $9.90! Perfect for new baby boys in the spring/summer...Newborn Boys' Lullaby Club® Plaid Shortalls 2-pc. Set - Blue 75% off for $3.74!! Under $2! It only comes in a large, but look at the price! Cherokee Squire Green Boys' Ultimate Polo - L 75% off for $1.74!!! Thank you again, Tiffany for helpin' a bargain shopper out!! 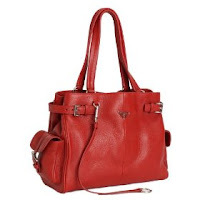 Like junk food, I'm also craving handbags. SALE $44.99 - 69% off and FREE shipping! I am making this with whole milk (because I'm not a Vegan). Cook all day on low (6 - 10 hours). Use an immersion blender to puree everything. You can also use a blender, but make sure not to fill it all the way or you’ll have a hot mess on your hands! Add milk and puree some more. Taste and adjust salt and pepper. Serve topped with fresh chopped thyme and chives. Do you like shopping with a buddy or do you shop solo? Thanks for the shout out Mel!! As for your question of the day..... I love to shop with a pal, but also enjoy some browsing on my own. After being home with the kiddos all day.... sometimes Mommy needs a mental break, and looking through the racks gives me that much need break. I'm a night owl too and haven't outgrown it! The soup looks good - I like the idea of the rosemary in it! I shop with a buddy or alone, doesn't matter. PS - I looked for you on Facebook, but couldn't find you. Maybe I spelled your name wrong. That potato soup looks fabulous! I get up early, but I'm the last one to go to bed! I finally managed to get my sleep schedule back to normal. SO no up at 3 am blogging. And I hate to go anywhere alone. Shopping with a friend always! 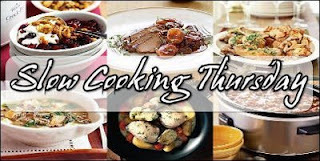 Have I told you recently how much I love your slow cooker Thursdays? Such yummy and simple meals. Perfect. Facebook - I'm an addict as well. Oh, and your question of the day...I don't really like shopping that much at all. So, with a friend is always better! Okay, I just realized that the last few posts on my blog have been about shopping. Thrift shopping is so different, though. Shopping with a buddy is the best for me! I actually don't just 'go shopping,' there's usually something specific that I'm looking for, so I'm ok going alone. LOVE the Prada bag!! Yummy soup! I think I'm going to try it this weekend. QotD: I like shopping alone because I rarely get alone time. I like the idea of shopping with others, but I usually find more deals when I'm alone. That soup sounds really good. Might have to give it a go! I tend to like to shop alone. I'm a get in a get it done kind of girl and that doesn't happen when you shop with friends. With friends if I have time and without if I need to tackle a list of items. I agree with Jenny, I find more deals when I'm alone. mmmmm yummy soup idea! brrr, it's cold here and soup sounds awesome. answer to the Q: i like to solo shop unless it's with my mom and sister. they are the solo shopping trump cards! PS I like to shop alone. This way I take my time and don't let other people's tastes influence what I'm considering purchasing. Depends. Sometimes I like to go alone. If I am just browsing. I need a second opinion if I am seriously shopping, however. Hello lady! I loveeee crockpot cooking! OH and I am also very addiccccttteedd to Facebook! I even have it attached to my blackberry! lol Facebook anonymous! Great finds...and so cheap! Score!! I'm addicted to FB too, dang it. I did all my Christmas shopping with my Mom and it was so much fun. I have to be in the mood to go to the mall and shop. After shopping on-line in the pj's at 2am the mall is a hard thing to take. :> But I love people watching, what a show!!! HI I found your wonderful site via "A duck in Her Pond" via the Muse. soup sounds good at this hour. Are you back in the wedding biz yet? I'm photographing them and loving it. It's new this last year for me from international journalism to weddings wheeeeeeeeeee! By the way glad you have a washing machine too. I love potato soup, but I usually add a bit of ham - I'm not vegan either. I love to shop alone!